Stress less with these 8 tips. - Rod and Kate for convenient local dog walking. Nothing says the holidays are here like being with family, friends — and vomiting dogs. We talked to animal experts and fellow dog owners for tips (especially to avoid that vomiting part) on how to take the stress out of holiday travel with your dog. If you're part of the 37 percent of people who travel with their pets, according to the American Pet Products Association's 2015-16 National Pet Owners Survey, read on! A dog begging for food at the holiday part table. Photography ©Rasulovs | Thinkstock. 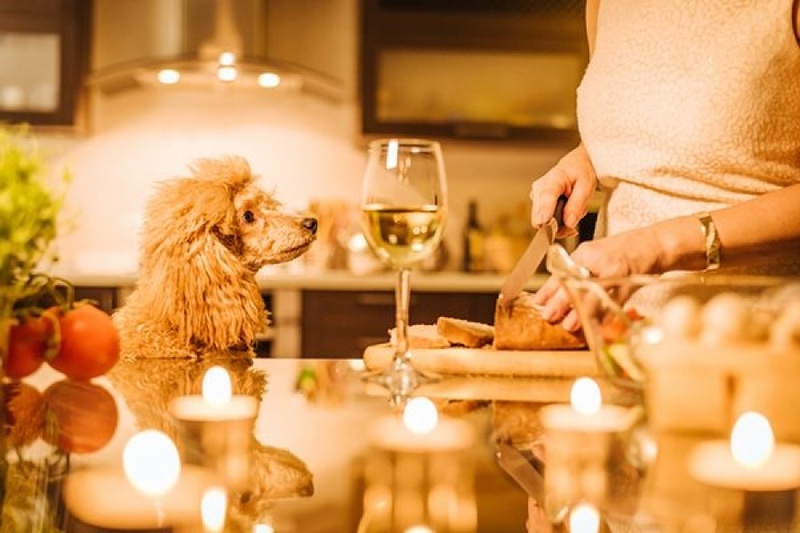 A big part of the holidays is the food, most of which is bad for dogs and can cause vomiting, diarrhea or even pancreatitis — no one's idea of holiday festivities. Your biggest challenge may be training your hosts not to give their scraps to your soulful-eyed dog. A small piece of turkey meat is fine; skin or fat isn't. Alicia Halloran, an animal communicator based in Henderson, Nevada, also learned the hard way what can happen when a dog eats the wrong food — and way too much of it — before traveling. Her Shih Tzu, Odie, got into a big bag of cat food the night before traveling for Thanksgiving. "The next day we were at O'Hare airport in the United Club. I took him out of his carrier because he was very fidgety. We were told dogs weren't allowed in the Club, and right before we left, he passed gigantic gas. Now I feed Odie lightly before traveling, as though for surgery." If your trip has multiple stops, Dr. Becker recommended getting disposable ID tags. "Every time you change location, include where you're staying and the phone number," he said. Ticks may not be prevalent where you live, but they might be where you're going. "Research where you're going and ask if there's anything your dog should be protected against," Dr. Becker said. Before the trip, consider some trial runs. "If your pet will be contained in a crate or carrier, condition him to spend time in there," said Kat Miller, Ph.D., CAAB, Certified Applied Animal Behaviorist with the ASPCA. "Keep the experience positive by providing something yummy for your dog while inside. Let him out before he has a chance to get upset about the confinement, gradually increasing the duration." Speaking of carriers, Dr. Becker recommended placing a light cover over it or using curtains on the windows to block out visual stimuli, which can cause stress. One of the most common mistakes is not researching accommodations, according to Steven Appelbaum, president and CEO of the Animal Behavior College, in Valencia, California. "A couple who lived in Southern California decided to visit relatives in Texas during the holidays. They assumed they'd be able to find hotels/motels along the way that would take pets. Unfortunately, the first night they found themselves with zero options. Rooms were either booked or didn't take pets. "These nice folks spent the first night sleeping in their car with their pets. Fortunately, the weather wasn't too cold. The entire experience could have been avoided with proper planning." Planning includes paperwork. "If you're traveling across state lines, bring along your pet's rabies vaccination record," Dr. Miller said. "While this generally isn't a problem, some states require this proof at certain interstate crossings." And plan for the unexpected. Dr. Miller also recommended packing extra medication your dog takes in case you are delayed. A big part of going on a trip, especially with dogs, is stopping. Dr. Becker pointed out that at official rest stops, every traveler's dog has used that same patch of grass. Instead, "Pull off the road, find an area with a large patch of grass," Dr. Becker said. "You can use the bathroom at a rest stop, but don't let your pets go there." Remember Steven's hotel story? That's not the only one. "I know of another dog owner who ignored the rules and booked a motel room," he said. "The facility didn't take pets, but he figured his dog was quiet and older and no one would notice. So he checked in, and given that this was the type of motel where you can drive to the approximate location of your room, he simply requested a room in the back of the motel. Later he went out for a quick bite to eat leaving his dog asleep on the bed. When he returned, he had a message from the manager. His dog awoke in a strange place and started barking excessively. Other guests complained, and since the motel didn't accept pets, this man found himself on the road at 12:30 a.m. looking for another place." When packing for yourself, pack a bag for your dog, too, including his own food, bowl, bed/pillow, and toy. "The more you can create a familiar and safe environment for your dog, the less stress they are likely to feel," Steven said. Another way to ensure your dog's comfort is establishing a time-out location. "Make sure wherever you go there will be a quiet 'retreat' area available for your pet if he or she gets overwhelmed by the day's activities," Dr. Miller said. Have a dog that needs regular grooming? Shelley Williams, a professional groomer and staff member with Animal Behavior College, said that groomers get very busy during the holidays. One owner learned this the hard way. "She ended up giving her dog a haircut Edward Scissorhands style! His haircut was a mess," Shelley said. "Schedule holiday pet grooming appointments early so you don't embarrass your pet and yourself in front of family and friends." Holiday photos where all anyone notices is your dog's crazy 'do is not the way you want to remember Christmas 2016. If you get your dog groomed where you are visiting, bring some "after" photos to ensure the desired results. "By doing this, it is unlikely that your dog will be returned with very, very short hair or naked," Shelley said. This, too, would result in some highly unfortunate family photos. There are some horror stories about holiday travel with dogs. Glad you are reading up on how to avoid these.